Many couples blame their marriage problems on disagreements and an inability to see eye to eye. Marriage counseling is a great option for couples who need to learn how to better communicate, but it might not solve the problem that caused a disagreement in the first place, especially if the problem involves money. So because money is a leading cause of stress in relationships, couples may want to consider money counseling before heading to a marriage counselor.Nearly three-quarters of all Americans experience some kind of financial stress, according to the American Psychological Association. When you are in a relationship with a partner who has different views or values about money, this stress can become further exacerbated. Throughout my years in the financial services industry, I have noticed that money counseling and marriage counseling often go hand in hand. One of my good friends, Leslie Webb, is a psychologist and will frequently send me her clients to help them budget and examine other underlying financial issues that may be causing their relationship stress. 1. One partner handles the money, while the other wants nothing to do with it. When it comes to managing household finances, both partners should be involved, or at least be aware of where money is being spent. Leslie and I are both currently experiencing an epidemic of clients who have mentioned that, within their relationships, one partner manages the finances and the other never looks into what he or she is doing. Societally, we used to view men as being responsible for a couple’s finances, but this is no longer the case. Both partners should have a role in managing money. 2. You have separate bank accounts. If you both want to keep an eye on your money, separate bank accounts might seem like a good idea, but they can actually cause a lot of financial stress in a relationship. Managing money should be a joint effort, and separate accounts do not allow you to work together as well. Having separate accounts can lead to one partner hiding expenses or debts from another and can create animosity, because there is usually going to be judgment against how one partner is spending. 3. You have different values about spending and saving. Just like religion and politics, it’s important for couples to have similar values when it comes to money. This is Copyright © 2018 The Kiplinger Washington Editors. All rights reserved. Distributed by Financial Media Exchange. something that’s often overlooked in the early stages of a relationship, but it tends to surface and cause tension later on. Before getting serious, it’s important for couples to talk in detail about what kinds of budgets and savings they have. These conversations are sometimes uncomfortable, so many people avoid them. “I think you should show copies of tax returns,” Leslie recommends. “This is rarely done and can make people uncomfortable, but it’s a great step in really getting honest about your finances.” It is also a good idea to talk about how your families handled finances when you were growing up. 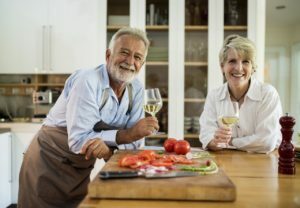 Because, more often than not, as people age and start taking more responsibility for their finances, they start doing things just like their families did. 4. You have different socioeconomic backgrounds. Having a different socioeconomic background than your spouse can cause more issues than you might think, because you’re likely used to handling and thinking about money differently. For example, someone from a wealthier background might not be used to worrying about money, while someone who grew up in a lower-income household might be more accustomed to saving, or might carry some debt. Money is power, especially in relationships. While it’s not necessary to date within your own socioeconomic status, it is important to have open and honest conversations about how you view money. This is especially true if one partner makes more than the other. Even if the intention is to be equal, the person bringing in more income is inherently more powerful. 5. You have different views on debt. This is something my wife and I have had to work through. You should always be honest with your partner about how much debt you have, but it’s also important to be on the same page with how much debt you’re comfortable accumulating. For example, my wife and I came from pretty different backgrounds. I was raised by two business owners who often took risks with their money and had debt. My wife was raised by two employees, so she was much more accustomed to having a steady stream of income. Especially if one or both of you has large-scale debt, you need to be on the same page about how to manage it and eventually pay it back. So, how can couples with money issues get back on track? If you’re looking to do it yourself, David Ramsey has great resources, and Leslie and I both recommend him to our clients. If there are bigger issues, I would recommend seeing a financial planner. Just like with marriage counseling, it sometimes takes a third point of view to resolve issues in a relationship. A good financial adviser can help you achieve that balance in your bank account and in your personal life. “5 Signs You Need Money Counseling, Not Marriage Counseling.” FMeX. 2018. https://fmexcontent.s3.amazonaws.com/3651/3651.pdf.